Planning a hot day at the beach? Nothing will suit your excursion better than a cold drink! 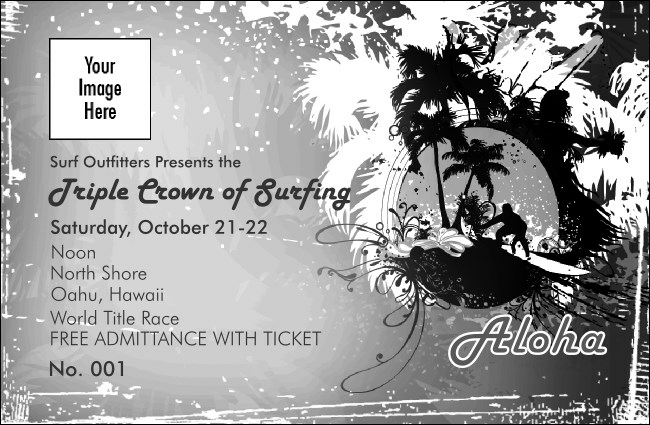 This black and white Aloha Drink Ticket is a great way to keep the refreshments flowing. Designed with a surfer catching some tasty waves against a palm tree background, it's a must for your next Hawaiian or island themed event! Like what you see? Check out the matching event kit available through TicketPrinting.com.